The Left Hand of Darkness looks at the history of nomadic fabric structures and our own practice of using folded origami forms. 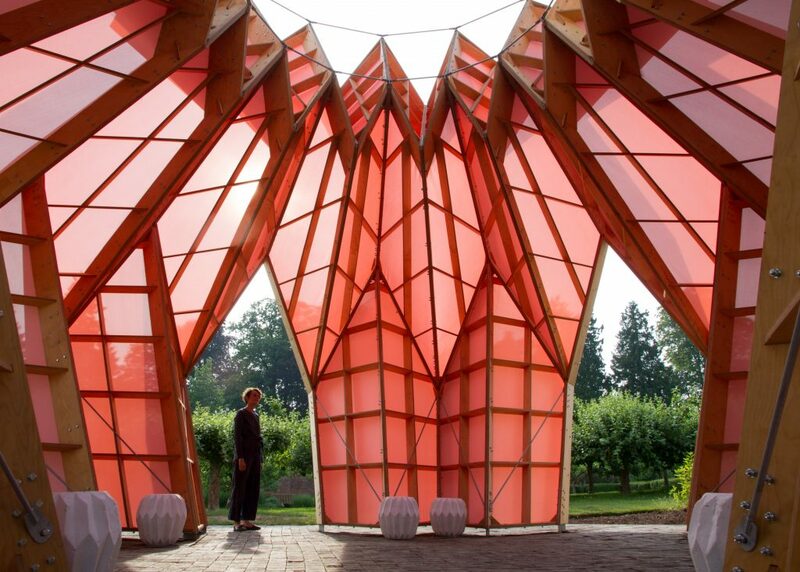 Using this as a starting point will develop a beautiful sculptural pavilion that is both a sculpture and structure. Sitting in the landscape artwork and yet providing space for shelter, performance, meeting. Heather Peak Morison (born UK, 1973) and Ivan Morison (born Turkey, 1974) have established an ambitious collaborative practice over the past fifteen years that transcends the divisions between art, architecture and theatre. They are co-directors of Studio Morison, their artist-led creative practice which supports and realizes their ideas and projects. On a societal level Studio Morison is working to re-establish civic life and on a human level, it looks to bring meaning, beauty and purpose into everyday life. They are based in Weobley, Herefordshire and Abergwynant, North Wales and work internationally. They are currently working to deliver a new library, a public glasshouse, a landscape for a school, several public sculptural pavilions, meeting places and civic spaces within communities, a skate park, developing an affordable and sustainable model for artist housing and shaping an artists’ commercial product collective. They have exhibited internationally including solo projects at Tate Modern, Museum of Contemporary Art Sydney, Vancouver Art Gallery, The National Trust, National Theatre Wales, Whitechapel Gallery, South London Gallery and represented Wales at the Venice Biennial. R&D investment through Without Walls Blueprint.